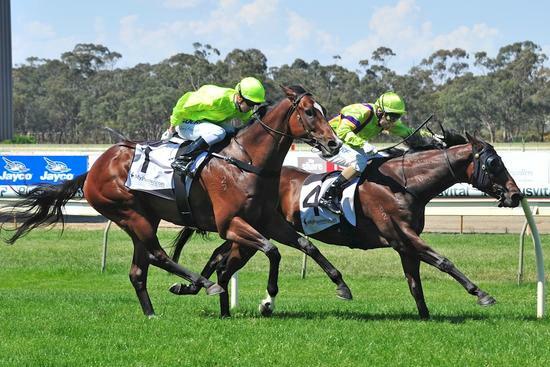 He has his quirks but Sword Of Justice showed his undoubted ability again with a determined win at Bendigo. Sword Of Justice needs a few things to go his way to show his best form and his best was good enough to claim the J Keogh and Sons Handicap (1300m) with a game front-running effort. The son of Medaglia D’Oro didn’t finish his race off when seventh at Bendigo at his previous outing at Bendigo on November 1 after which trainers Mathew Ellerton and Simon Zahra decided to remove blinkers from Sword Of Justice’s gear. Andrew Mallyon took over aboard Sword Of Justice in the $30,000 race and sent the five-year-old straight to the front from where he was never head. Mallyon got his pace exactly right in the run, leaving Sword Of Justice enough fuel to stave off his rivals in the straight, scoring his fifth career win by a head. “I thought if I got a couple of easy sectionals, then work into the corner and stay in front, he might go on with it,” Mallyon said. “He’s not a bad horse when he puts in. Mallyon said the gelding was capable of winning better races than the BM78 contest with the added confidence from his latest win. “I think if he can maintain a margin on them and sustain that gallop, he does make it hard for them to go past,” Mallyon said. Sword Of Justice’s latest success earned connections another $16,500 in stakes, pushing his prizemoney tally to more than $143,000. Congratulations to great stable supporters Contract Racing and everyone involved with Sword Of Justice’s terrific Bendigo success.